If I said I'm not a bag label whore, I'd be lying. While I'm definitely not your monogram LV-loving girl, I do like a well made label bag which doesn't scream 'I is carrying a branded baggie! ', yet has a distinctive enough design that is immediately recognisable. My collection of branded bags seems to be growing, from what was a little Fendi Ostrik, a Kate Spade classic tote (a gift from a cousin), an electric blue Chloe Paddington to the most expensive buy yet, a black Balenciaga First. The next bag I'll be adding to my collection is a Miu Miu coffer in gold (I know, so ostentatious, but I couldn't resist). Luckily, I know these bags are just way too far out of my reach that I'll just content myself with ogling them online...or hunting down cheap Korea lookalikes hurhurhur. Most of my close friends know about this already, but there was a reason why I was in London a couple of months ago. At that time, I didn’t really want to tell too many people, especially those at the office, as I hadn’t quite made up my mind yet. But now that the official announcement has been made, I can now say that I’ve been offered a position with the UK office, and will be moving to London next Jan. I thought long and hard about this – whether I was ready to make a big move to live overseas and truly become independent. Timing-wise, it couldn’t have been more perfect. I’m single, no children, no commitments to tie me down in S’pore, and I’m pretty much at the right age where one gets the hankering to make a big change in life. As they say, the window of opportunity gets smaller each year. Funnily enough, I’ve always had a strange affinity to London. Maybe it’s too much reading of Enid Blyton and Famous Five books from childhood, but a holiday visit with my family when I was 13 sealed the deal. Despite the cold and gloom, there was such a charm to the city that really attracted me, and from that time onwards, I always felt it would be great to live and work in London someday. (he plays the piano! He’s a whiz at the violin! He dreams of being a conductor! He can cook fancy French food! He speaks German! He cleans!). While the anime really is all about a girl and a boy falling in love, I like to think that it’s also a lot about the music. Anything that describes Mozart’s music with the words “pink-coloured aura of love” gets a big thumbs-up in my book. 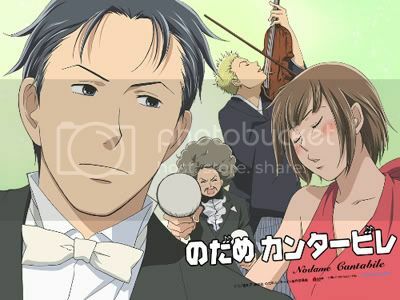 But aside from the crazy humour and laugh out loud gags, I loved this series because it brought back a love for classical music, playing snippets of some beautiful piano sonatas, violin sonatas and symphonies within the series, like Mozart’s Two Pianos sonata, Beethoven’s Spring sonata for violin, Elgar’s violin sonata and Beethoven’s Symphony No. 7. Also, having played in an orchestra during my schooldays, it brought back pleasant memories of playing in a large group, and digging down and becoming familiar with the nuances of a piece of music. One of my peeves when watching shows which feature people playing the piano and violin is that the producers never make any effort at ensuring the actors at least look like they are proficient at playing the instrument. 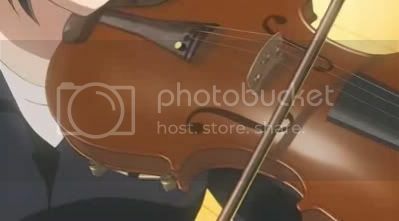 Invariably, the pianist’s fingers won’t match the soundtrack being played, or the prodigy violinist can’t even hold a violin properly and has some really funky bowing technique. Anyhoo, if you want to watch it online, you can do so at crunchyroll. Like getting a new phone! I've had my Motorola Razr for about 2 years now, and the battery is now at the point where I need to charge it almost everyday if I use it for conversations lasting more than 5 minutes. 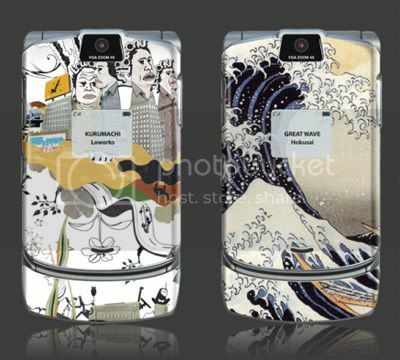 I was thinking of changing it for the LG Chocolate in pink, but finding Gelaskins, a company that specialises in making decorative skins for your iPhone, laptop and iPod, has made me reconsider keeping the phone and just buying a new battery. 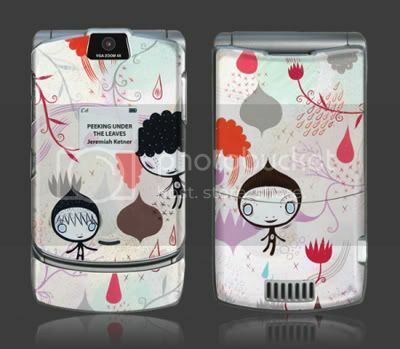 PS If you don't have a Razr, but still want sticker goodness on your tech gadget, you can consider getting makie stickers from Japan. I discovered these in Tokyu Hands while on holiday last year in Tokyo. I think I spent about 20 min in the sticker aisle trying to decide which patterns to get.